The three Tory leadership hopefuls vying to become Alberta’s next premier say they will take part in the Pride Calgary Festival this weekend, including a contender who participated in a controversial event this year organized by an anti-gay minister. Ric McIver said Thursday he will attend events at Sunday’s Pride festival, though scheduling conflicts prevent him from marching in the parade. “I want to be premier of this province and that means I need to represent and look after all Albertans, and that’s certainly something I feel strongly about,” said the Calgary-Hays MLA and former cabinet minister. McIver apologized in June for participating in that month’s March for Jesus, saying he was unaware of the anti-gay comments posted online by its organizer, street minister Artur Pawlowski. McIver’s fellow Progressive Conservative leadership candidates, Jim Prentice and Thomas Lukaszuk, both plan to march in the parade, as will a host of other politicians who have their sights set on the premier’s office. Wildrose Leader Danielle Smith will march for the first time, while Liberal Leader Raj Sherman and NDP leadership candidates Rachel Notley and David Eggen are also expected be in the parade. Premier Dave Hancock — who marched in Edmonton’s Pride parade in June — said this week he will be in attendance at a Pride brunch in Calgary. Tansy Wong, spokeswoman with Pride Calgary, said the critical mass of political leaders and parties taking part was exciting for the organization, calling it another major step forward for the province. 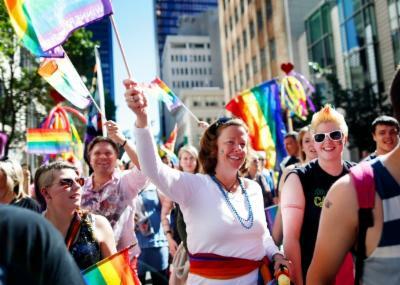 It was only two years ago that Alison Redford made history by becoming the first Alberta premier to attend the Calgary Pride Parade. She did so again last year by becoming the first to actually march in the parade. Wong welcomed McIver’s participation in the festival but is surprised he isn’t marching along with his leadership rivals, which would have done more top erase some of the concerns raised by his participation in the March for Jesus. “It possibly would have improved his image within the LGBTQ community. It would have definitely helped,” she said. There are also other sticking points with the Progressive Conservatives and the Wildrose Party, Wong noted. A Liberal motion to support gay-straight alliances in schools was defeated this spring by Wildrose MLAs and a significant portion of the PC caucus. A section of the Human Rights Act passed by the PCs that allows parents to pull their kids from class when issues of sexuality and sexual orientation and religion are discussed also remains an irritant. “I think there might be a little bit of a mixed reception,” said Wong. Wildrose Leader Danielle Smith — whose party foundered in the 2012 provincial election in part because of writings of one candidate that gays would be consigned to a “lake of fire” — said she’s hopeful that other parade participants will recognize the points of agreement between themselves and her party. She noted Wildrose backed a suite of legislative changes this spring that included removing the definition of marriage as a heterosexual union and allowing transgender people to change their birth certificates more easily.